I have used and loved the BuiltNY two-wine carrier enough to give it out as a gift to several friends, and so I’m recommending it here as well. It’s made of the same stuff deep sea divers wear (neoprene), so it is very effective at keeping your wine at a constant temperature, while being lightweight. Perhaps more importantly, it looks chic, especially when walking into a BYOB restaurant. The durability scores points too — I’ve had mine for three years and it’s like new. Plus, it’s easy to store, as it flattens out for storage in a drawer or the linen closet. It comes in several colors, and in one- and two-bottle versions. (Go with the two-bottle, as it’s similarly priced and light and svelte enough to not be burdensome when carrying just one bottle.) They also have a six-pack version for beer lovers. Of course, there are those who think that leather is more classic and impressive than neoprene. And so, there is a leather wine bag, which holds two bottles in plush velvet lining and includes a shoulder strap for easy carrying. 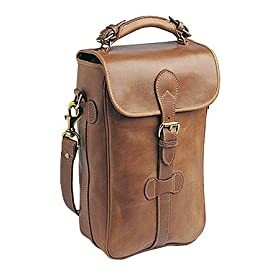 But hey, if you’re going to go leather, go all the way and get this Mulholland 2 Bottle Wine Carrier Leatherwine bag, which has an insulated lining to keep wine at optimum temperature. Not to be left out, the granola crowd will enjoy the Picnic Time Meritage Wine and Cheese Tote For Two, which is ideal for hikers whose pinnacle moment is peaked by a hilltop picnic. (OK, enough puns for one sentence). This fairly lightweight polyester bag has enough room for two bottles of wine, plus the following included picnic accessories: a wood cutting board, waiter-style corkscrew, two cotton napkins, stainless steel cheese knife, two acrylic wine glasses, and a bottle stopper. All you need to add is the wine, the cheese, and the energy to hike up the nearest mountain. A similar bag for picnics but looking a little more stylish is the Picnic At Ascot Ivy two-bottle carrier. The simulated suede covering gives a more upscale look but doesn’t include all the extras. It does, however, have compartments for the corkscrew and wine stopper (included). OK, let’s get something straight — I HATE cutesy wine stoppers. But many people think they’re just so cute and wonderful and this one has a Christmas theme so here it is. It’s a three-piece set that includes Santa, boozed-up Blitzen, and an unidentified reindeer (looks like Donner to me, though which one they put in your set is anyone’s guess). Sorry, no Rudolph, whose red nose would have been appropriate, but was considered offensive to people who suffer from alcohol flush reaction. If you’re interested, click on the image to purchase this from Amazon. This is a great buy if your wine lover is like me – often emptying only half a bottle. Yes, the half-bottle trick works well enough, but it’s a lot easier to use the Vacu-Vin to preserve an unfinished bottle of wine. Another reason I like the Vacu-Vin is that it enables me to open two or three bottles in an evening and not feel guilty about it. Often, I’ll open a bottle and find that it doesn’t quite go right with my meal — and being the geek that I am, I’ll open another (and another) to try and get a closer-to-perfect match. Or, I may want to have a glass of white before moving to a glass of red toward the end of the meal. Since the Vacu-Vin comes with two stoppers, you can keep two bottles fresh for the next few days — although if your wine lover is as geeky as me, you might want to purchase additional stoppers for the stocking.